The Assassin's Creed Council, announced today by Ubisoft, is a new site the publisher describes as "the number destination for fans of the Assassin's Creed universe." Members will receive inside information about the stabtastic series, access to exclusive content, and opportunities to interact with members of the development team and the Assassin's Creed community. 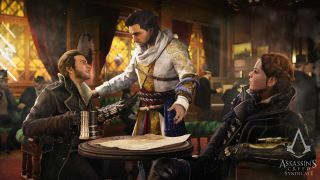 The Council already contains quite a bit of content, including a link to purchase an official bust of Ezio Auditore, the lead character in Assassin's Creed 2, and an image of an Apple of Eden that will soon go on sale. There are also a a number of "News from the Studio" entries, including an illustrated look at the evolution of the Assassin gauntlet, some early concepts of Jacob Frye's costumes, and an interview with Creative Director Marc Aleix Côté, plus several user-submitted posts. Dedicated fans can earn points, which will carry them further along the "Council path," plus various sorts of badges, and a leaderboard is in the works as well. All in all, it strikes me as quite a bit like Steam's community pages, but dedicated to a single series rather than everything. And it's free to join, which is for the best frankly. Check it out at council.assassinscreed.com—and since we're here, a reminder that the next addition to the Assassin's Creed lineage, Syndicate, is out on PC on November 19.